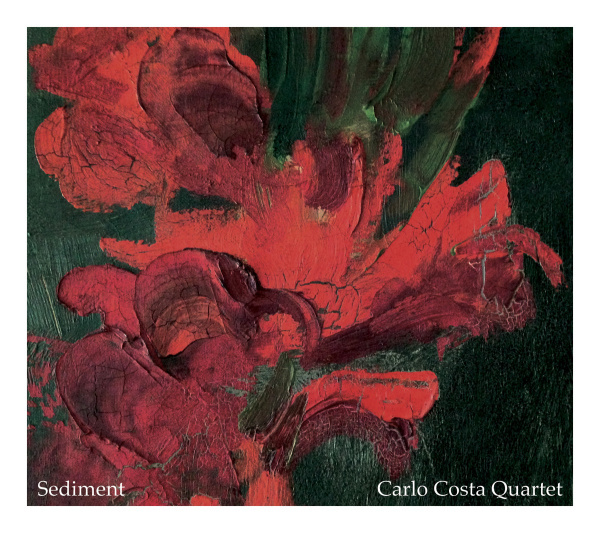 Sediment is an interesting new foray into free improvisation, based around concepts percussionist Carlo Costa outlines to his bandmates. This certainly is no easy task, for free improvisation is a very difficult thing to do well. Getting the right balance of voices in any given ensemble takes a lot of time and practice playing together. With time musicians learn cues from one another, if even just subtle gestures or phrasings, that suggest where a person is headed. The result for the Carlo Costa Quartet is a minimalist, cavernous collection of six tracks on this record. The musicians assembled here all have a well-developed appreciation for small sounds. Costa is not a drummer that overwhelms his audience with thunder. Rather, he plays in a very sensitive, precise manner, often favoring the resonance of cymbals, gongs, or even brass bowls, over the snare or other drums with a more regimented sound. Even when he concentrates on the drums, he creates beats that produce a deeper resonance, rather than cutting through the sound of the other musicians. In so doing, Costa creates pockets that the sounds of the other musicians come to inhabit, stretch, and remold through the course of playing. The musicians on this record bring their own personalities and contribute considerably to the overall sound and shape of the record. Saxophonist Jonathan Moritz, an underrated presence on the New York scene, treats us to a great number of thin, precise tidbits as he works around the space and silence. Trombonist Steve Swell and bassist Sean Ali bring their own sensitivities for subtle, often unnoticed possibilities on their instruments that are placed on center stage by the openness of Costa’s approach. At times, each member of the quartet exhibits buzzing electricity, but each is also capable of creating an aqueous solution in which the solid sounds of the others are allowed to dissolve. Throughout the record, Costa works as an alchemist, playing with the elements. His approach is to strip away the fluff and get down to the rawest sounds that coexist and intermingle in their purer forms. At times the music take a metallic or industrial turn, at other moments, a mellow pulse. These sounds, quite abstract in their initial form, seem to accumulate in our ears, layer upon layer, through the record building towards a cohesive overall musical aesthetic. The music on this record rises and falls like life itself. “Wither,” “Pulverize,” and “Thaw,” warm up our ears to Costa’s sonic world. “Bloat,” and “Soak” then elevate the level of energy, scraping, colliding, disparate sounds that draw us out of our solitude in the darkness towards glints of light, transformation. The life of this music seems to be reaching its peak there, then again fades into shimmering silence. Recorded by Jonathan Goldberger, Dec 17, 2013. Also mixed by Goldberger. Mastered by Jon Rosenberg. Cover photo and design by Carlo Costa.